Virtual base class encapsulating mapped-grid coordinate systems. The CoordSys class is a pure-virtual base class providing an API for performing operations in a mapped grid coordinate space. Implementations of specific coordinate systems will be provided by derived classes. given indices in a_box, return centers of cells (or of faces, or of edges) in mapped coordinates. The function does the right thing based on the centering of a_box, which must be the same centering as a_Xi. Jacobian evaluated at location Xi in mapped space. Set time for moving grids. Const is already well entrenched. Implemented in AnalyticCS, CartesianBlockCS, CartesianBlockRotateCS, CartesianCS, CubedSphere2DPanelCS, CubedSphereShellPanelCS, CubedSphereSolidBlockCS, CylinderEquiangularBlockCS, CylinderSpokesBlockCS, NewFourthOrderCoordSys, RThetaPhiCS, RThetaZCS, SchwarzChristoffelRampCS, TwistedCS, WarpedCS, and XPointBlockCoordSys. Reimplemented in CubedSphere2DPanelCS, CubedSphereShellPanelCS, and NewFourthOrderCoordSys. Implemented in CubedSphere2DPanelCS, CubedSphereShellPanelCS, and NewFourthOrderCoordSys. 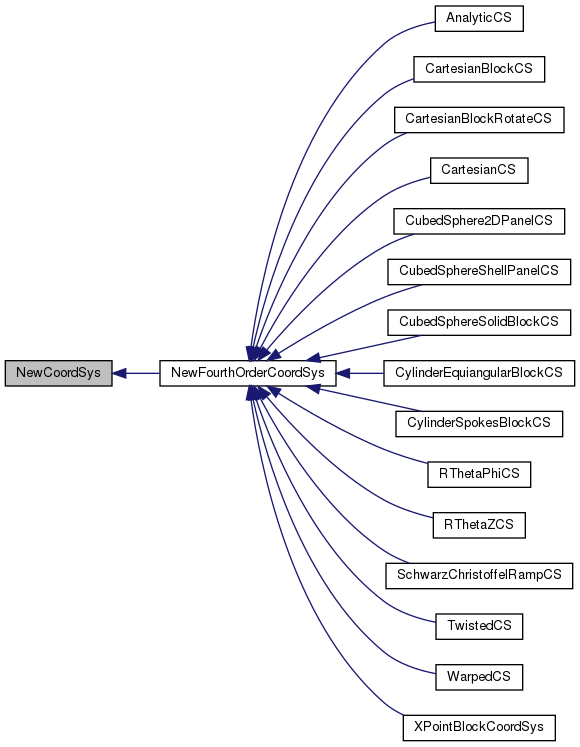 Reimplemented in NewFourthOrderCoordSys, and XPointBlockCoordSys. The dimensionality of the space may not be SpaceDim if, for example we're computing on a manifold. One example of this is the surface-of-a-sphere mapping, which is a 2D surface in a 3D space. For that case, dimension() would return 3 even though SpaceDim is 2. Default implementation returns SpaceDim. Reimplemented in CubedSphere2DPanelCS, and CubedSphereShellPanelCS. Return cell volume in a_vol on cells of a_box, using a_N from getN() defined on a_box grown by 1.
if a_fourthOrder is false, then only do a second-order dot product aFforGrad is the F used to compute grad_perp(F); returns results in a_product on a_box; both a_FforGrad and a_N (from getN()) must be defined on a_box grown by 1.
if a_fourthOrder is false, then only do a second-order dot product; returns results in a_product on a_box; both a_F and a_N (from getN()) must be defined on a_box grown by 1.